Previous work carried out on the west gable wall and roof and reder repairs, have unfortunately, been unsuccessful, and we need to carry out futher work, which will be the THIRD and we hope, FINAL phase of the refurbishment. 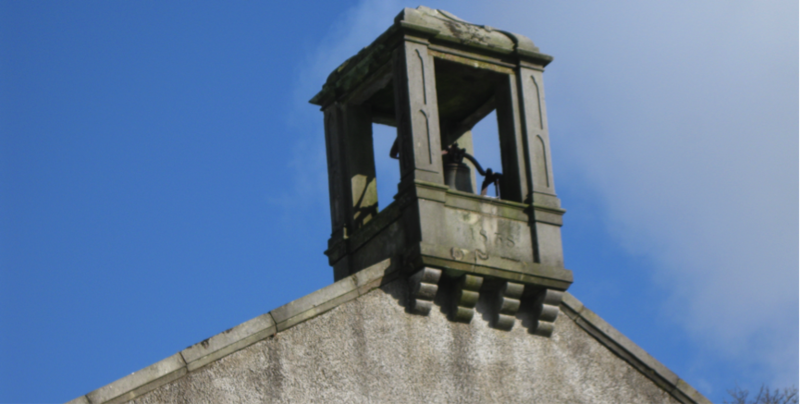 - repair and refurbish bell tower and BELL! We have been very successful with Grant applications however there is still a shortfall to meet the overall cost of £65,000, any donations towards this essential work would be gratefully received. You may donate online or by cheque. For further information see below. The newly refurbished Muckhart Parish Church is now officially open. 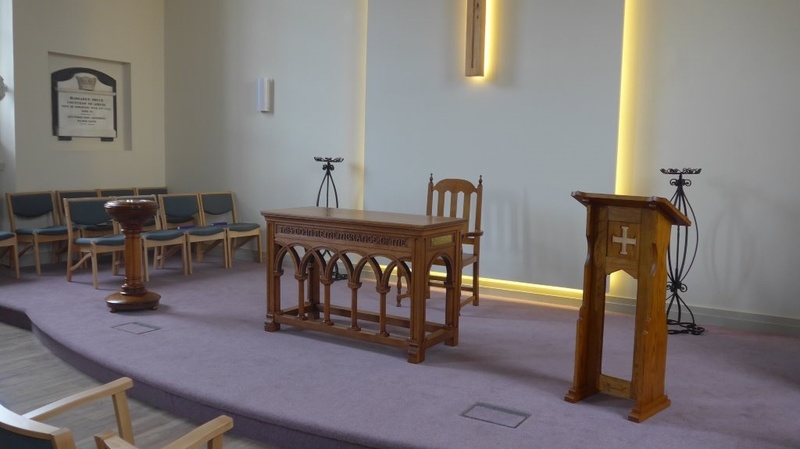 A project which was originally first considered back in 2004, after the sale of the old manse, left surplus funds which the General Trustees made available to us for the refurbishment and improvement of the church. In 2012, it became necessary to proceed with the project as a matter of urgency, when wood rot was identified in the floor. On further investigation it was found that the pews, which were built into the floor joists were also infected with wood rot, therefore the entire floor and pews would have to removed and replaced. Who was involved in the refurbishment ? A development group made up from volunteer members of the congregation came together to identify the church’s project priorities and requirements, and to assist our architect in the preparation of the design brief, the result of which is the facility you see here this morning. We have benefited from an excellent design team, whose experience in renovating churches and listed buildings was invaluable to us, in providing a design to meet our needs. We were fortunate that local contractors Murdoch Smith from Dollar, won the tender and undertook the construction work. We are indebted to them and their subcontractors, for their commitment, patience and positive approach to the project, all helping us to bring this challenging project to a successful conclusion. The final element of the refurbishment is the large cross made by Mr Andrew Smith, of Muckhart. The cross has been made using timber recovered from the best wood from the old pews, and incorporates a time capsule, with the Muckhart Book and recent pictures of the church and local community. Phase 2:- Covering the internal works including the replacement floor, creation of a new social space with kitchen unit, disabled facilities, rewiring and new heating and improved entrance, with a project value of £150,000 (excl VAT). 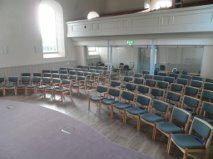 The Kirk Session’s overall objective for the project was to ensure the church building was returned to a good condition and to provide a more attractive, comfortable and flexible facility, suitable for Christian worship in the 21st century, which would also be a valuable asset to the church and the local community. 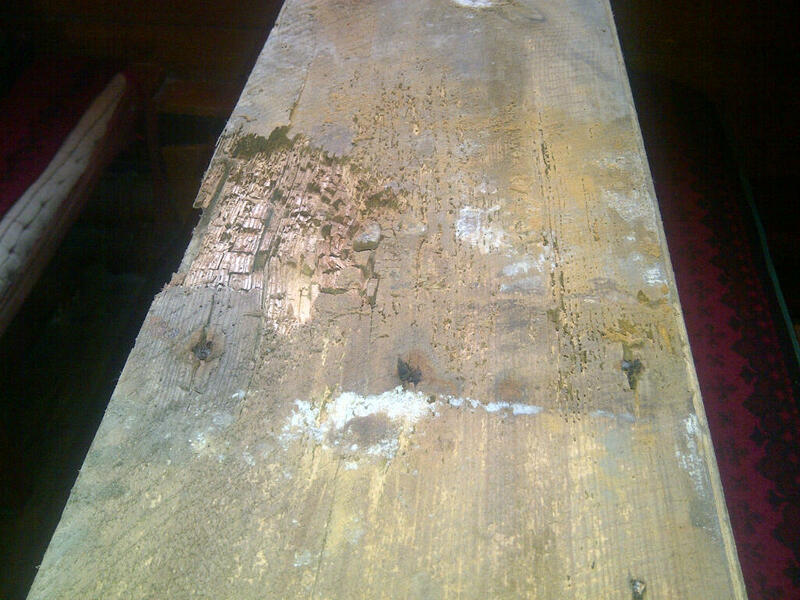 As is not unexpected on any refurbishment project, further wood rot was identified; however we were not prepared for the extent of what was found behind the pulpit structure on the East gable. The entire area including the pulpit had to be stripped out, dried out and then replaced with a newly constructed inner wall. Unfortunately the pulpit, which we had intended to retain, was also found to be badly damaged by wood rot and could not be returned to the church. Whilst we had allowed a financial contingency, the above wall repairs and unforeseen drainage works resulted in a unanticipated additional costs on the project of £30,000 (excl VAT), resulting in an significant challenge to the church, to find the additional funds. 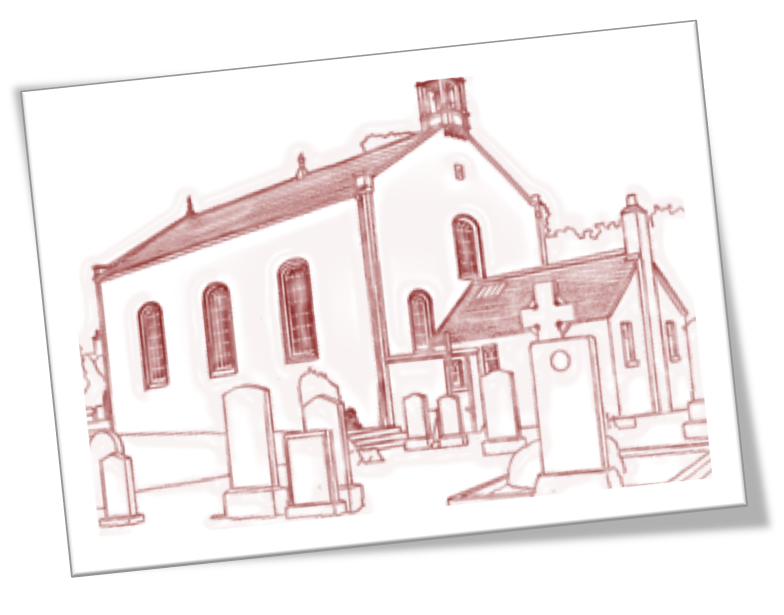 Further works remain to be undertaken when funds become available, such as the external painting of the church windows and some further roof repairs. More information please contact : John Anderson, Property Convenor, Muckhart Parish Church. It is still possible to donate to the Property Fundraising Account directly. If you would like to do this and qualify for gift aid, we would appreciate if you could please email the Treasurer with the amount of your donation and your full name and address, so that your donation may be significantly enhanced accordingly.